The film “Spongebob Squarepants And The Big Wave/Spongebob Squarepants – The Movie ” on DVD, UK version. The film is available on this DVD in english. 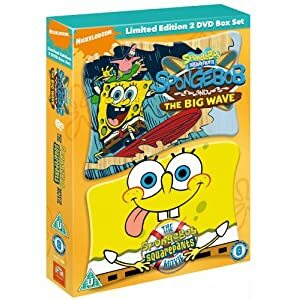 This version of “Spongebob Squarepants And The Big Wave/Spongebob Squarepants – The Movie (UK Version)” was released in 2009. Le film “Spongebob Squarepants And The Big Wave/Spongebob Squarepants – The Movie” en DVD, version anglaise. Le film est disponible en anglais sur ce DVD. Cette version de “Spongebob Squarepants And The Big Wave/Spongebob Squarepants – The Movie (Version anglaise)” est sortie en 2009. The Film “The Big Tease” on DVD, UK version. The film is available on this DVD in English only. This version of “The Big Tease (UK Version)” was released in 2001. Le film “The Big Tease” en DVD, version UK. Le film est disponible en Anglais sur ce DVD. Cette version de “The Big Tease (UK Version)” est sorti en 2001.